Has the summer heat got you sweating? When the weather hits extremes and your air conditioning system is outdated, old, or just plain poor-performing, you probably feel the need for an urgent change— and wish you knew what kind of unit would best beat the temperatures. Or maybe you’ve just witnessed an astronomical rise in your cooling bills from an old, clunky air conditioning unit. If you’re thinking of making a change to your home’s heating and cooling system, it pays to research your options. Split System: Units are described as “split systems” when they have portions of the unit installed in the exterior and interior of the home. The air conditioning unit will be used in combination with a furnace, making it an ideal choice if you already have a gas furnace installed in your home and are looking to upgrade to central air. 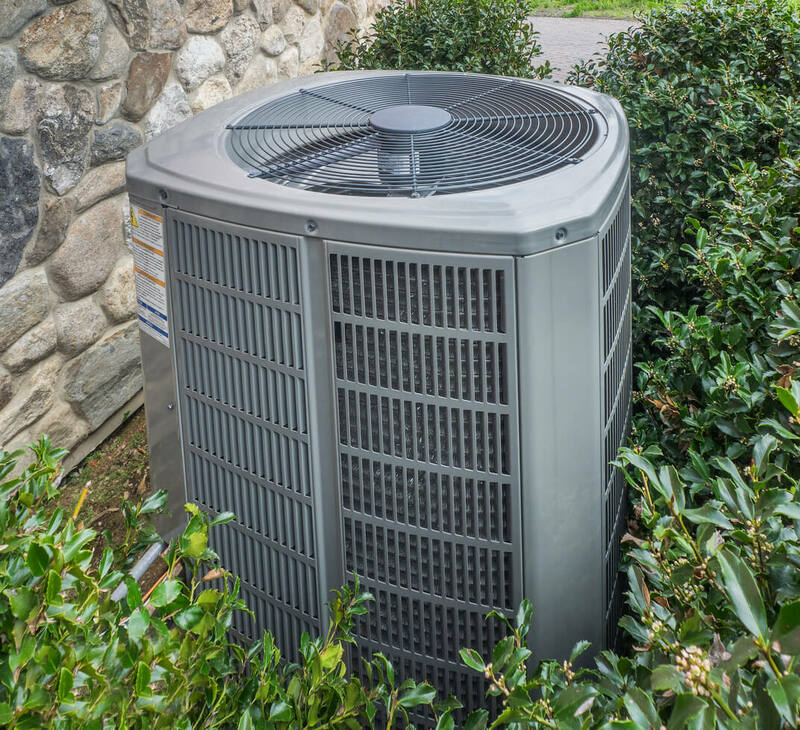 The outdoor part of the unit generally contains a fan, condenser, and compressor, while the internal unit houses the fan and evaporator. Pros: Fairly energy efficient, can be retrofitted to an existing furnace. Cons: Units are more expensive because the installer must work inside and outside of the home. Heating oil can be expensive, depending on price fluctuations, and it is also not that efficient. That’s why hybrid systems use both an electric heat pump and a furnace— the heat pump option allows you to rely on electrical heating (a much more energy-efficient alternative) and only switch to gas on extremely cold days. This makes them a great choice for homes in temperate climates, but heat pumps also work hard in warmer weather, too. They help cool and dehumidify interiors, as well. Beyond those distinctions, hybrid systems have a structure similar to split systems, with components housed indoors and out. Cons: Although domestic gas may cheap now, don’t expect those prices to continue forever. If you’re really looking for maximum energy efficiency, switching solely to a heat pump might be a better option. Duct-Free Split System: Most HVAC systems use a network of ducts to spread heated or cooled air throughout your home. However, this system isn’t always ideal, especially in parts of your home off the main building (think garages and additions). Ductless systems rely exclusively on a heat pump and don’t suffer from the heating and cooling losses common with duct leaks, so they’re much more energy-efficient. The indoor components are mounted directly on the walls, with no vents or ducts to worry about. Pros: Increased energy-efficiency—Just one of the benefits of a ductless system is that it could save the average homeowner $875 a year in lowered energy costs, per the US Department of Energy. Ductless systems also offer a more flexible alternative to traditional ducts and can be more readily installed in a home since there’s less work to do. If you suffer from allergies or prefer your home be extra clean, the absence of ducts means less dust, pet hair, pollen, and other irritating substances are distributed through the air in your home. They’re also safer, since they’re combustion-free and won’t give off carbon monoxide. Cons: Some HVAC professionals feel that heat pumps aren’t an ideal choice for colder climates. Additionally, duct-free systems will require more frequent maintenance and replacement since the heat pump’s components are working year-round. Packaged System: Packaged HVAC systems are ideal for small homes that are too confined to separately house interior components. All parts of both the AC and heating systems are installed outdoors, saving you space. Pros: Space-efficiency and less expensive than HVAC split systems, since components are installed in one place. Cons: Generally, these HVAC systems are not as efficient as split system units. “Best” means different things to different people, but if savings are a concern, highly energy-efficient equipment is ideal. This will help you keep energy expenses lower long-term. While the makeup of your HVAC system will largely determine its energy efficiency—namely whether or not you install a heat pump or strictly use a combustion furnace—there are industry measurements that can help you determine the rated efficiency for different models. When you’re shopping for air conditioning units, compare each model’s Season Energy Efficiency Ratio (SEER). A SEER rating of 13 or 14 is the mandatory federal minimum, but homes in warmer climates may be required to purchase models with even higher ratings—the higher the number, the more efficiently your system will run. For heating systems, the unit’s Annual Fuel Utilization Efficiency (AFUE) rating will help you determine how much energy the equipment uses. The federal minimum AFUE rating is 78 percent, but for maximum efficiency, look for a rating in the 80s or 90s. An HVAC system isn’t just the sum of its components—it will need to be installed properly to ensure that it runs efficiently and well. Therefore, finding a qualified contractor to do the installation is key. HVAC contractors should carry a license to do this kind of work in your area. Additionally, if your contractor is further certified from the North American Technician Excellence or the Indoor Environment and Energy Efficiency Association, that’s a great sign that they are best suited for your home improvement project. Evaporative coolers: Homes in drier climates sometimes find evaporative coolers to be a fit alternative to traditional AC units. These systems blow air from the outdoors over water-saturated pads, which acts as a natural coolant, and adds humidity to dry desert air. Evaporative coolers are generally understood to use less energy than traditional central air conditioners, and instead of using harmful chemical refrigerants, they cool using natural water, making them a greener choice. However, they may not be ideal for humid areas. Radiant heating: If you’re building fresh, or if you’re considering remodeling your home’s floors, radiant heating is a more energy-efficient solution. In radiant heating systems, a network of thermal tubes is installed below the subfloor. The tubes, which are filled with either water or glycol, are connected to a heat pump or boiler that distributes heat throughout the room. Radiant floors have the benefit of being highly efficient, especially compared to combustion furnaces—and they use physics to heat a room more effectively, since heat tends to rise, whereas ducted heat systems may be vented from high on the ceiling. However, they are hard to retrofit into homes, as they require a complete overhaul of your home’s flooring, which can make them expensive, to boot. Solar space heaters: For a smaller area, or to add even out costs in cold climates, solar space heaters offer a more affordable option by capturing the heat coming directly from the sun. Solar air heaters use thermal heating collectors and can even be used in place of central heating in a home. In these systems, a water pump keeps liquid—usually a combination of water and antifreeze—passing over a dark-colored plate. The heat is then collected and pumped into a home’s interiors. Some very energy-conscious homeowners even use them in combination with radiant flooring to keep homes super efficient! The decision to replace all or part of your heating and air conditioning system takes consideration and will impact your home’s overall comfort for years to come. Meanwhile, with technological advances in system efficiencies, it pays to be knowledgeable about your model before you buy.